The sense of direction @ Corrosia! New website for love.abz, experimental theatre plays where the computer becomes cowriter of the play. 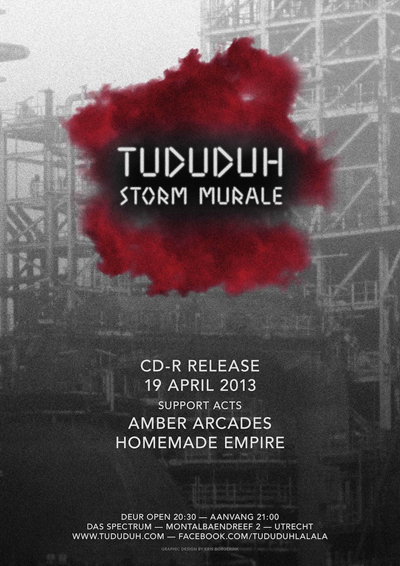 For Tududuh I designed an albumcover and promotional material for the release. Risoprinted in a limited edition of 150 unique handfolded cases. 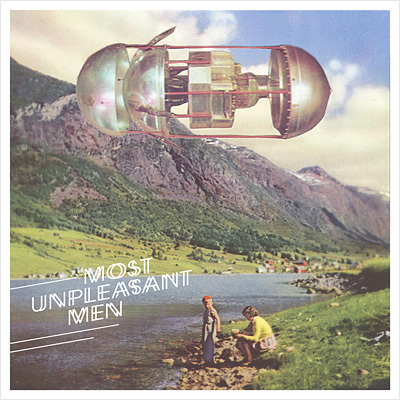 The typeface, Tududigital, was specially designed for the artwork. 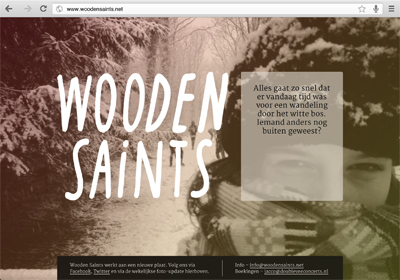 A temporary website for Wooden Saints that shares updates on the making of their new record. The website automatically grabs, processes and publishes their latest facebook update that includes an image. 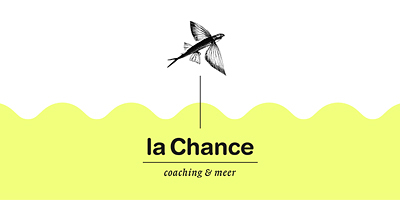 A project for the Province of Utrecht. 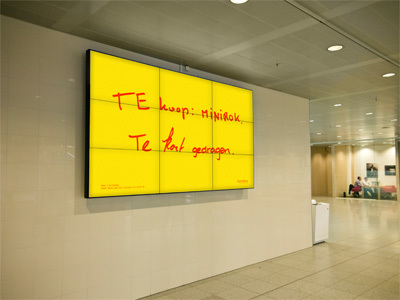 As part of their art programme at the Provinciehuis a series of 24 Six Word Stories were chosen to be shown on the announcement screens throughout the building. The function of the stories was to interupt in the daily routine of the people in the building by infiltrating the announcements every now and then during the day with a new story every two days. The stories themselves had no direct connection with the building or the people in it but were meant to give them a small pinch or small thought to take with them. 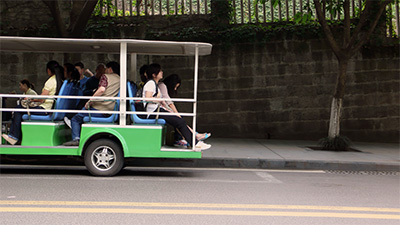 My idea was to create a connection between the people and the stories by letting them participate in the design process without knowing in advance. I asked 141 staff members to write down a word from one of the stories. Afterwards I processed every word and built up the sentences for the 24 Six Word Stories. The final designs were made in distinctive colours in order to contrast with the regular announcements. 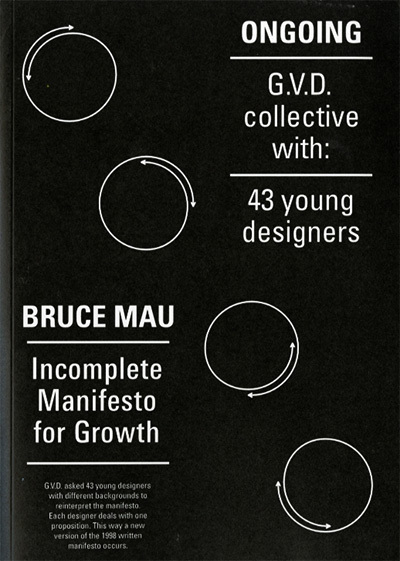 Each design has its participators credited on the bottom. 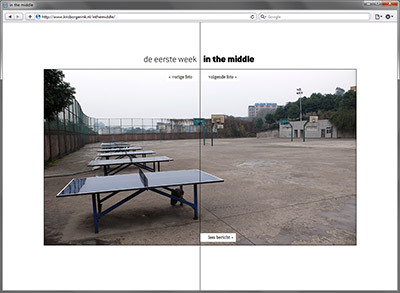 A new website for Niels Stomps. 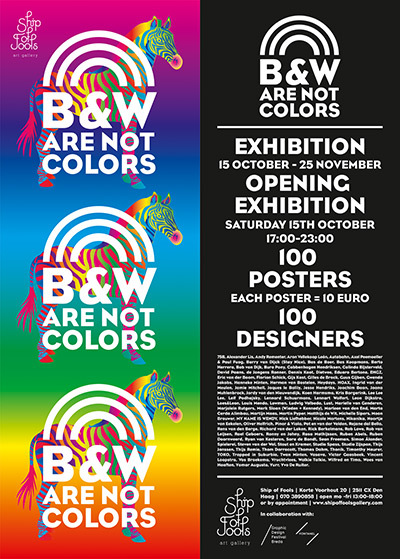 Poster for 'Black and white are not colors' exhibition. 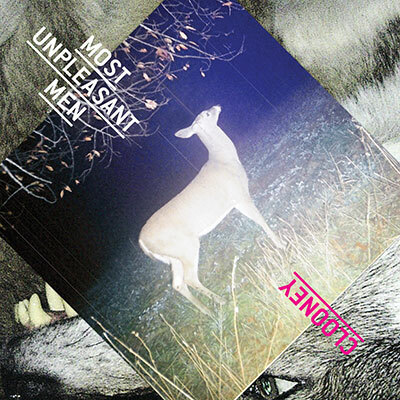 MP3 cover for 'Clooney', the fourth release of Most Unpleasant Men's 'A Collection of Scraps'. I also made the website for the project. 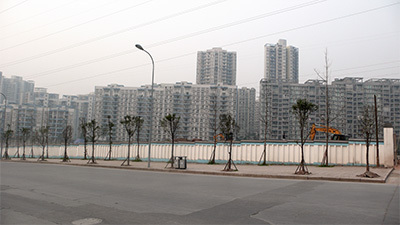 A series of my Chongqing photos are published together with a story of Kim Bos in Tijdschrift EI. 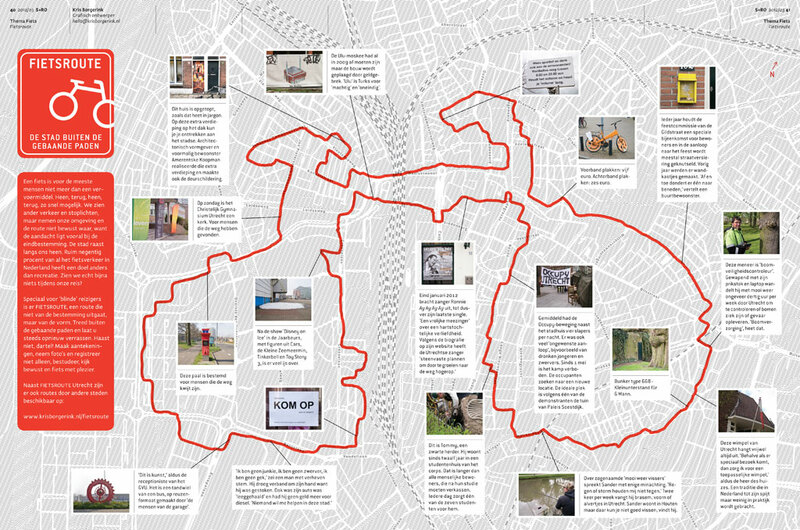 I presented the first results of the collective cityscape of Utrecht on 23 December in Academie Galerie Utrecht. A thick book including a large city map and a wall full of cityscapes are the result of this first research. Club 3voor12/Utrecht is a monthly evening full of live music at dB's, Utrecht. For this year Iris Deppe and I are working on a new visual identity for the promotional material. Since Iris was still in China and the Club had a little celebration of the 50th edition, I made a special poster and flyer for the first edition. The concept is simple. 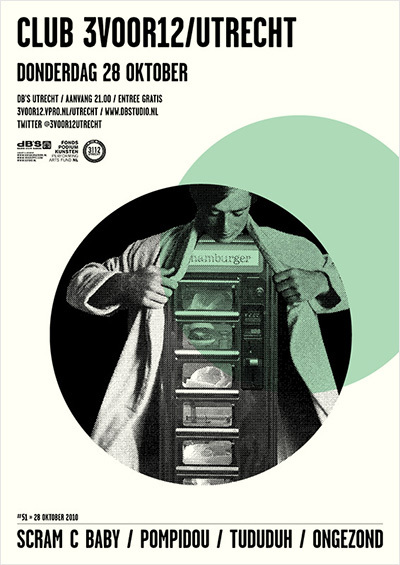 Every single band that ever played in a Club 3voor12/Utrecht edition is listed on the poster, including number and date of that edition. 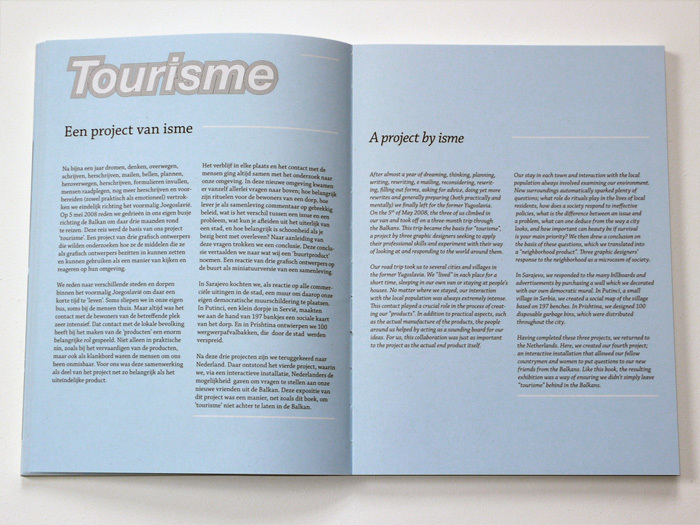 Tourisme will be part of the CO-LAB exhibition at Academie Galerie, Utrecht. A short note from a busy designer. Working on some new projects. One of them is for the Province of Utrecht. More on that soon. 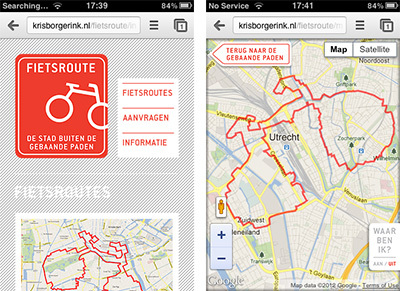 And FIETSROUTE is going well. Many requests came in and most of them are finished. 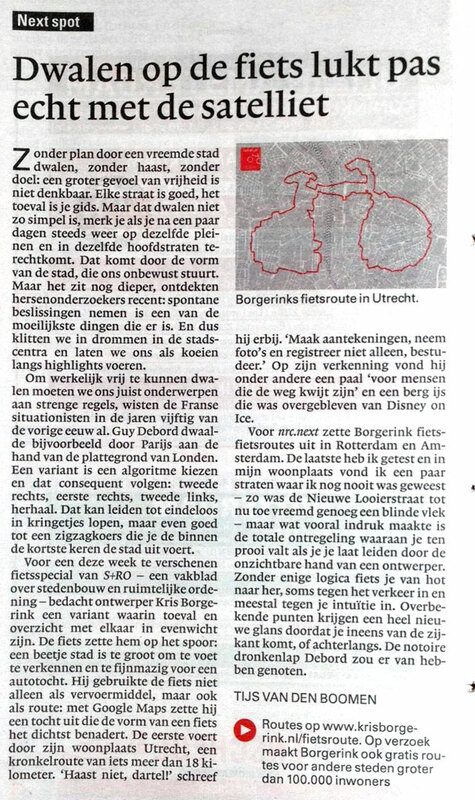 Also S+RO, nrc.next and AD wrote articles about the project. 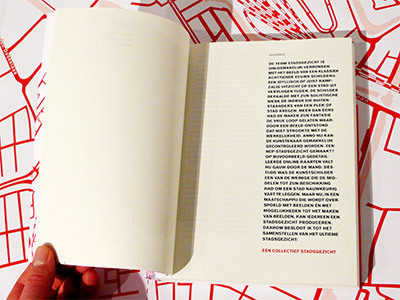 Together with Kim Bos I made a work that is exhibited at Gemeente Museum Den Haag. 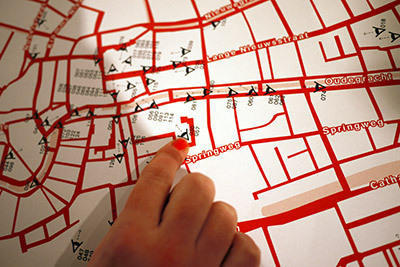 It is part of Zomer Expo 2012 which will run from 15 june – 19 august 2012. A short impression of the opening of 'Black and white are not colors'. Because of its great success the exhibition is extended till 23 of December. 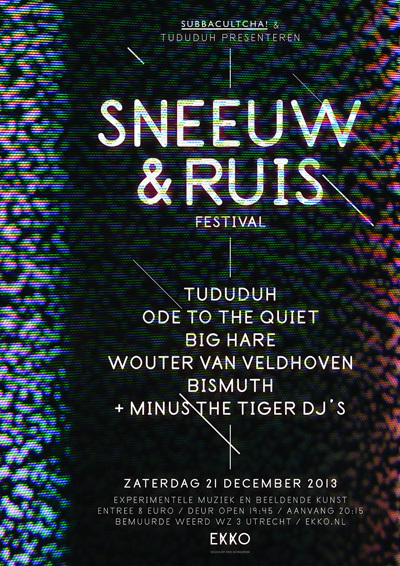 And posters can also be ordered online at Fontanel till 16 December. I'm participating in the exhibition 'Black and white are not colors', initiated by Fontanel, Graphic Design Festival Breda and Trapped in Suburbia. Posters will be for sale for only 10 euros and all the money goes to food aid for Africa. 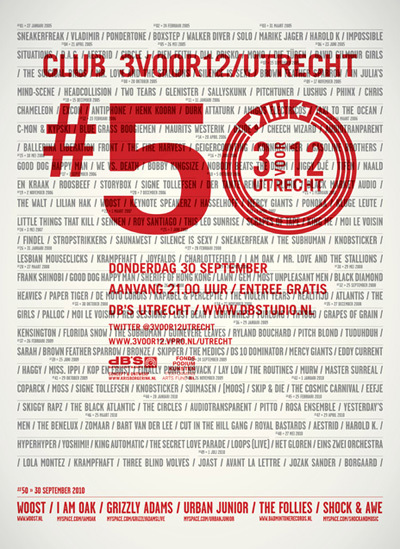 The opening will be on Saturday 16th October 2011, 17.00 hours, at Ship of Fools Gallery in The Hague. The exhibition closes on 25th November 2011. Lots of stuff going on! 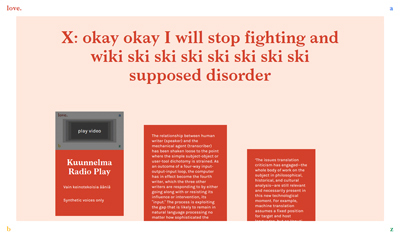 I'm working on several websites. 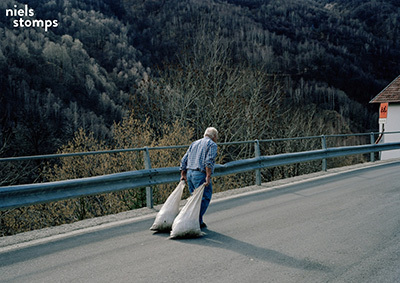 One of them is for Italian photographer Valerio Spada who recently won the Grand Prize of Photography Book Now 2011 with his impressive book 'Gomorrah Girl'. I'm also preparing the first exhibition for the 'Tijdmachine' series during Grenswerk festival in Enschede, 25th September till 2nd October. 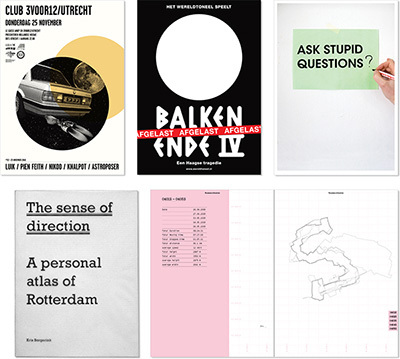 'Ask stupid questions' will be exhibited at 22nd International poster and graphic design festival of Chaumont from 22 May to 5 June 2011. GVD (together with GDFB) organized this exhibition, just like the first one. 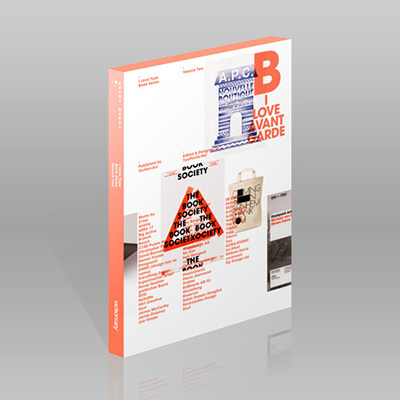 They also designed a nice publication for it featuring all the works. ZET Foundation asked me to present one of my projects at ART PIE Istanbul 2010 (October 30 - November 7). 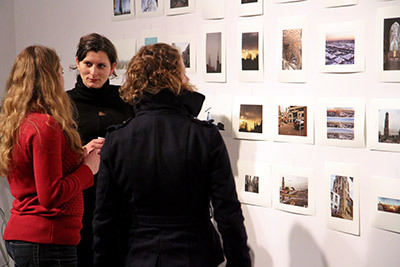 ART PIE is an international art fair for artists run initiatives. 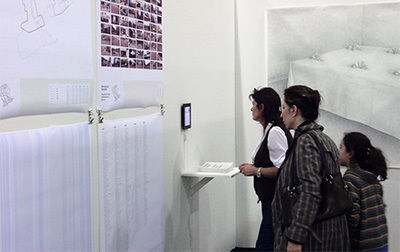 This fair is part of Istanbul Art Fair 2010. I exhibited 'The sense of direction'.